TAUNTON, Mass. – In the bottom of the sixth inning, Taunton put together a rally to try and regain the lead against King Philip (21-4) in Friday night’s Div. 1 South final at Jack Tripp Field. The first two batters reached and moved into scoring position on a sacrifice bunt. An intentional walk loaded the bases for No. 9 hitter Rylie Murphy. It was a hunch that paid off with a South title. Murphy battled to a 3-2 count against KP starter Elise Pereira, who was only a strike away from escaping the jam, before turning on a pitch and smacking a grounder down the third base line. KP third baseman Jess Bonner dove but the ball hit a mound of dirt in front of her, took a huge hop, and bounced into shallow left field, bringing in the game-winning runs. “It’s like what you have in dreams, two outs, 3-2 count, bottom of the sixth inning and you just hit it and you don’t even know where it goes and all of a sudden your coach is screaming, jumping up and down and you’re so excited,” said Murphy after Taunton’s 4-2 victory, which earned the program’s first South title since 2007. The Warriors were far from finished. In the top of the seventh, Bonner ripped a hard line drive to third but Jaime Brown knocked it down and made the play for the first out. Brooke Taute and Brianna Lacy were both hit by pitches from freshman Kelsey White to bring the go-ahead run to the plate. White got a pop-up in foul ground and a soft liner that shortstop Hanna Aldrich made a nice running catch on to end the game. It meant the Tigers won the season series with KP, after splitting two games in the regular season (and losing the Kelley-Rex title to the Warriors) and fulfilled a mission for the team’s three seniors and for Brown, who was an eighth grader when Taunton made the final in 2015 but lost to Silver Lake. Taunton took the lead for the first time in the second inning. Kelsey White lined a one-out single to left and her sister Alexa, a junior second baseman, drilled a double down the leftfield line to bring in the game’s first run. As expected in a rivalry that is fast becoming one of the best in the state, one run was not going to be enough. KP battled back in the top of the fourth to jump in front. Hailey McCasland led-off with a walk and moved to second on a groundout. Faith Turinese singled to right but the runner had to hold at third. After Turinese stole second, KP coach Norm Beauchemin called for a Pereira squeeze bunt, but Kelsey White fielded her position well to scoop the ball to catcher Kya Enos for the second out. The Tigers nearly got out of the inning unscathed, but Aldrich bobbled a Bonner grounder to extend the inning and bring in the tying run. Taute followed that by crushing a ball to dead center that was inches from being gone. Instead it was an RBI-double to put KP up 2-1. Taunton almost came right back to tie it after Handrahan started the bottom of the fourth with a double, but she was stranded. In the fifth, the Tigers did even the score. Paige Silvia lined a double to left center and moved to third on a sac bunt by Murphy. Brown grounded a ball to KP shortstop Meghan Gorman, who was playing deep enough to allow the run to score. In the sixth inning, Handrahan again got things started with a single off the glove of Bonner, who was at full stretch going to her left. Aldrich lined a ball off the leg of Pereira and into no-man’s land in front of second base. Kelsey White’s sac bunt moved the runners into scoring position and Beauchemin called for an intentional walk of Alexa White to give KP a force at the plate. It worked on the next hitter, as Silvia’s grounder to Bonner turned into the second out when the third baseman gunned down the lead runner. Murphy came up next and with the pressure on, she delivered the hit that decided the South title. Murphy tried to reflect on what was going through her mind as she stepped up to the plate in the decisive moment, knowing that this was a chance to not only win the game, but also to give the upperclassman the title that they have been craving since their last final appearance four years ago. “It’s so overwhelming,” she said. “I’m just so glad that I got to be to be able to be in the game and be around to hit the ball. I just feel so amazing to win. Taunton (24-2) will face the winner of Methuen and Newton North in the state semifinal on Tuesday night at Martin Field in Lowell. PLAINVILLE, Mass. – Last year, the King Philip Warriors saw their season end in the MIAA D1 South Quarterfinals. This year, the #4 Warriors were able to book their trip to the D1 South Semifinals in Taunton for the third time in four years as they beat the #11 Somerset-Berkley Raiders, 4-1, on Monday afternoon at the Plainville Athletic League fields. The senior tossed a complete game for the win, giving up seven hits and just one run while striking out six. On the Raiders side, pitcher Abigail Cadorette also went the full game, giving up 10 hits, four runs and two walks with a pair of strikeouts in the loss. The King Philip offense saw contributions from several players, including catcher Brianna Lacy, who went 1-for-2 with a run and an RBI. First baseman Brooke Taute and second baseman Hailey McCasland both went 2-for-3 with a run, while shortstop Meghan Gorman went 1-for-3 with a run and an RBI. For Somerset-Berkley, catcher Lindsay Chubbuck scored the team’s sole run, going 1-for-3 in the process. Shortstop Megan Antaya hit 2-for-4 with a single and a double from the Raiders’ leadoff spot. The game started off, and for the most part remained, a pitchers duel between Pereira and Cadorette, with each side’s getting a hit or two before being shut down by the opposing pitcher. The Warriors broke through and put themselves on the board first in the bottom of the third as they put three of their first four batters of the inning on base, and a bases-loaded walk to third baseman Jess Bonner sent Gorman home for the early lead and easy RBI. Both pitchers would again shut down their opponents in the fourth, with Cadorette retiring the side in order. After giving up a leadoff hit to designated player Courtney Faris to start the inning, Pereira sent down the next three batters, two through strikeouts. That would change in the fifth, however, as Cadorette walked McCasland to start the inning, then gave up a single to Gorman to put her in scoring position. Outfielder Faith Turinese lined out through a diving catch by second baseman Julyanne Pacheco, but her ensuing throw back to first went out of bounds, allowing both KP runners to advance. After initially sending McCasland and Gorman to second and third respectively, both umpires convened and ruled that the runners had tagged up and awarded them each an extra base, giving the hosts a 2-0 lead as McCasland crossed the plate. Somerset-Berkley made their offensive presence felt in the top of the sixth as Chubbuck led off the inning with a single down the right field line, and found herself in scoring position shortly after through a sacrifice bunt by Faris. Cadorette hit a grounder, but an infield error allowed her to reach and advance to second and for Chubbuck to score, pulling the Raiders within one run. The Warriors, however, had different plans. Back-to-back-to-back singles from the bottom of the order loaded up the bases quick for King Philip in the bottom of the sixth, and Taute and Lacy were able to score off tag ups on fly outs from outfielder Sydney Phillips and Gorman respectively, making it 4-1 for the home team. Somerset-Berkley attempted to come back in the seventh, as a two-out single by Antaya gave them hope, however a ground out to Pereira by Pacheco on the next at-bat ended the game, as the Warriors sealed the deal. King Philip (20-3) will return to action Wednesday against #9 Braintree at 5:00 Taunton High School for a shot at going to the D1 South championship. PLAINVILLE, Mass. – As the warm weather has rolled in, so have the dominant performances from King Philip’s Elise Pereira. The senior right-handed pitcher has been superb in the circle over the past few weeks for the Warriors and has also shined at the plate as well. That was the case again on Tuesday afternoon as Pereira earned the win in the circle and highlighted offensive attack with a grand slam in the third inning, helping King Philip pick up its most impressive win of the season, 12-2, over Milford. The win snapped the Scarlet Hawks’ 43-game win streak dating back to early 2017. It also clinches the second straight Kelley-Rex title for the Warriors. Pereira allowed two runs on five hits and just one walk in a complete game effort, striking out six. Milford had three of its five hits in the fourth inning and scored both of its runs in that frame. Pereira only allowed three base runners in the other six innings. “Tip your cap to KP, they played a great game,” said Milford head coach Steve DiVitto. “Pereira was excellent, she kept us off balance all game. We were able to put the bat on the some on the second and third time through but you just have to tip your cap, today was their day. It most certainly wasn’t our day but I’m proud of the way the girls continued to battle and fight. They played a full seven and that’s what you look for at this time of the year. After a quiet first two innings for both sides, King Philip made a big splash in the bottom of the third. Bri Lacy lined a single into right to lead off and Nicole Carter laid down a sac bunt to move courtesy runner Marjorie Guerrier to second. A single from Sydney Phillips put runners on the corners and Hailey McCasland reached on a fielder’s choice to load the bases with one out. Meg Gorman drove in the first run with a single, keeping the bases loaded. After an out, Pereira hit a sharp line drive over the center field fence at the PAL fields for a grand slam. Two pitches later, Jess Bonner got a hold of one and launched it over the fence in left for a 6-0 lead. The Warriors loaded the bases again, all with two outs, but Kelley Reichert induced an infield pop up to escape further damage. “We hit the snots out of the ball,” Beauchemin said “We had 12 hits today….we don’t have fictitious batting averages, ours are earned. Our batting average against [the Davenport] division is 0.489 as a team. And I don’t think we lowered it today. We bat 0.379 against [the Kelley-Rex] so when you compare apples and apples, and oranges and oranges, we’re not a bad team. Milford responded in the top half of the third as Kate Irwin raced around to third for a leadoff triple. A sacrifice fly from Emily Piergustavo put the Hawks on the board, and Jess Tomaso followed with a single. The Hawks had a player ejected on the next play after a close call at first but Shannon Corier came up with a line drive single to bring Tomaso in to make it 6-2 but Pereira got a strikeout to end the inning. With the ejection, the Hawks were forced to put a field player at catcher for the remainder of the game. KP’s Brooke Taute reached on an error to lead off the bottom of the fifth inning and quickly stole second. Lacy connected on an RBI double to make it 7-2. Nicole Carter reached on an infield error and Phillips loaded the bases on a fielder’s choice. McCasland connected on a single to bring a run in, Carter scored on a passed ball, and Phillips crossed the plate on a sacrifice fly from Gorman to put the hosts up 10-2. “That’s what we lacked last year…we had a lot of hits but we didn’t get the hits at the right time,” Beauchemin said of his team putting up runs in bunches. “Now we’re getting them at the right time. We have confidence 1 through 9, every girl can put the bat on the ball. We came into this game with 58 strikeouts on the season, now we’re at 59 in 21 games. The Warriors tacked on two more runs in the bottom of the sixth. Pereira got things started with a leadoff walk and courtesy runner Liliana Rolfe went to third on a single from Taute, who quickly stole second. A walk to Lacy loaded the bases and Rolfe raced home to score on a passed ball. Carter brought in another run with a line drive single to center to plate Taute but Milford center fielder Kate Irwin gunned the second runner down at the plate for the third out. King Philip softball finishes the season 18-3 overall and 15-1 in Hockomock play. Milford (18-1 overall, 14-1 Hock) closes the regular season on Thursday when it hosts North Attleboro. Mansfield, 8 @ Walpole, 1 – Final – Mansfield continued to improve its resume for the postseason with a win over Walpole. The Hornets’ offense scored in every inning but the sixth inning and after the Rebels tied the game 1-1 in the top of the second, Mansfield responded with three runs of its own in the bottom half. Tyler Dalton (RBI, run) and Mike Hargadon (two RBI, run) each had two hits for the Hornets while Dan Saraceno was responsible for driving in two more runs. Kevin Dow earned the win, striking out 10 with four hits allowed and two walks. North Attleboro, 8 vs. Bishop Feehan, 3 – Final – North Attleboro scored three runs in the fifth inning to break open a 2-2 game and never looked back to beat Feehan. Brendan McHugh scored from first after a throwing error on a sac bunt, Nick Sinacola scored on a Zach DeMattio double, and DeMattio came across on a sac fly from Nick Raneri. The Rocketeers added insurance in the sixth inning when Nate Pearce launched a three-run home run to make it 8-3. Feehan took a 2-0 lead in the first inning but North tied it in the bottom half on Pearce’s two-out two-RBI single. Pearce finished the day with five RBI, DeMattio had a pair of doubles, and Sinacola went 3-for-3 with three runs scored. Matt Wanless earned the win, allowing one earned run in 6.1 innings of work while striking out five. Taunton, 6 @ Durfee, 2 – Final – Taunton’s Tyler Medeiros dazzled on the mound, striking out 11 to earn the win for the Tigers. Medeiros allowed one earned run on three hits and no walks in a stellar performance. Jacob Crawford had a three-run triple for the Tigers while Medeiros added two hits, a run scored, and two RBI. Stoughton @ Canton – Postponed to Tuesday, 5/29 at 3:45. King Philip, 19 @ Foxboro, 0 – Final (5 inn.) – King Philip’s offense accounted for 21 hits as the Warriors rolled to a big win on the road over Foxboro. Elise Pereira launched a three-run home run while Brooke Taute and Jess Bonner each added a solo shot in the game. Taute, Meghan Gorman, and Faith Turinese each had three hits while Marjorie Guerrier and Hailey McCasland each belted two hits. Pereira and Turinese combined to throw a two-hit shutout. Mansfield, 2 @ Holliston, 4 – Final – Mansfield had the tying run on second base in the top of the seventh inning but a nice play in right field robbed the Hornets of a hit and put an end to the visitor’s rally. Sydney Woods had a pair of hits for the Hornets while Kara Bendanillo, Mady Bendanillo, Kerran Holmes and Caitlin Gomes each had one hit. Mansfield pitcher Sarah Cahill struck out six and allowed four hits. Stoughton, 2 @ Canton, 3 – Final – In a rematch from earlier in the week, Stoughton once again took wins at first and second singles but Canton won the match with a sweep of doubles play and a win at third singles. Freshman Minh Duong won 6-2, 6-4 at third singles, the team of Justin Luk and Tyler Duffy picked up a 6-3, 6-4 win at first doubles and Charlie Malloy and Aidas Jakubenas earned a 6-7, 6-4, 14-12 win at second doubles to seal the win. Stoughton freshman Waseem Sablon, who finished his rookie year at 10-6, won 6-4, 6-2 at first singles and junior Erik Anderson prevailed 6-1, 6-3 at second singles. Franklin, 1 @ Sharon, 4 – Final – Sharon picked up a win in a clash of two of the top teams in the Hockomock this year. The Eagles swept singles play with Fred Bondar (first singles, 6-2, 6-3), Andre Olivei (second, 6-3, 6-2), and Danujan Thirumavalavan (third, 6-0, 6-0) all picking up wins in straight sets. Ashwin Sreevatsa and Arie Chinnappin earned Sharon’s fourth point with a 6-2, 6-0 win at second doubles. Franklin’s Derek Wu and Tyler DiPalma were victorious, 6-4, 6-4, at first doubles. North Attleboro, 4 @ King Philip, 1 – Final – North Attleboro swept singles play and notched another win in doubles to earn a non-league victory over King Philip. Senior Richard Bermudez prevailed with a 6-4, 3-6, 6-1 win at first singles, senior Christian Bermudez won 6-1, 6-1 at second singles, and freshman Jonah Manso notched a 6-0, 6-3 win at third singles for the Rocketeers. The team of sophomore Alex Pfeffer and Sam Gallagher won 6-2, 6-4 at second doubles. KP’s Sean Desroches and Nate Ihley won 1-6, 6-3, 6-2 at first doubles. Canton, 4 @ Stoughton, 1 – Final – Canton concluded its season with a win over Stoughton, dropping just one game among its three singles matches. Natalie Keppler won 6-0, 6-1 at first singles to finish off an impressive rookie season. Fellow freshman Rachel Kupferman won 6-0, 6-0 to cap her strong debut season while Sarah Hernandez also won 6-0, 6-0 at third singles. The team of Nyah Claiborne and Rose Hazam prevailed 6-3, 3-6, 10-8 at second doubles. Stoughton’s Ellie Kashian and Alex Soto emerged from first doubles with a 4-6, 7-6 (6), 10-8 win. North Attleboro, 5 vs. Bishop Feehan, 0 – Final – North Attleboro picked up its 13th win of the season with a clean sweep of Bishop Feehan, taking all five matches in straight sets. Jordan Willis won 6-0, 6-0 at first singles, Emily Chiasson notched a 6-1, 6-0 win at second singles and Katie Ovoian earned a 6-4, 6-3 win at third singles. Azka Siddiq and Leah Marceau recorded a 6-4, 6-1 decision at first singles while Shurobhi Nani and Tara Nair emerged with a 6-3, 6-1 victory at second doubles. Taunton, 3 @ Greater New Bedford, 1 – Final – Taunton went on the road and picked up a 3-1 (25-21, 22-25, 25-11, 25-13) win over GNBVT to finish the season undefeated at 18-0. Malik Charles stepped up to deliver a big performance for the Tigers, finishing with six kills, 12 assists, and 16 digs. Lance Law added 14 kills, nine digs, four blocks and two aces, Lens Esquil chipped in with 10 kills and one block, Collin Hunter added six kills, two blocks, and 10 digs, and Ricardo DaFonseca finished with 28 assists and chipped in with a pair of kills. King Philip, 6 @ Oliver Ames, 5 – Final – King Philip rallied for five runs in the top of the seventh inning to steal a win on the road against Oliver Ames. Sophomore Robbie Jarest had a two-run triple to push across Chris Sawyer and Jeremy Rhines for the tying and winning runs for the Warriors. OA took a 2-0 lead in the fifth before KP cut the lead in half with a Jarest sacrifice fly that scored Timmy Nault (three hits). The Tigers tacked on three more runs in the bottom of the sixth before KP rallied in the top of the seventh. David Morganelli allowed one earned run in five innings of work. For OA, Jacob Levine was 2-for-3 with an RBI, a walk, and a run scored and Chris Pearsons went 2-for-4 with a run scored and a stolen base. Matt Muir went 6.2 innings on the mound and gave up only two earned runs for the Tigers. Sharon @ Milford – Postponed to Wednesday, 5/23 at 4:00. King Philip, 2 vs. Bishop Feehan, 1 – Final (8 inn.) 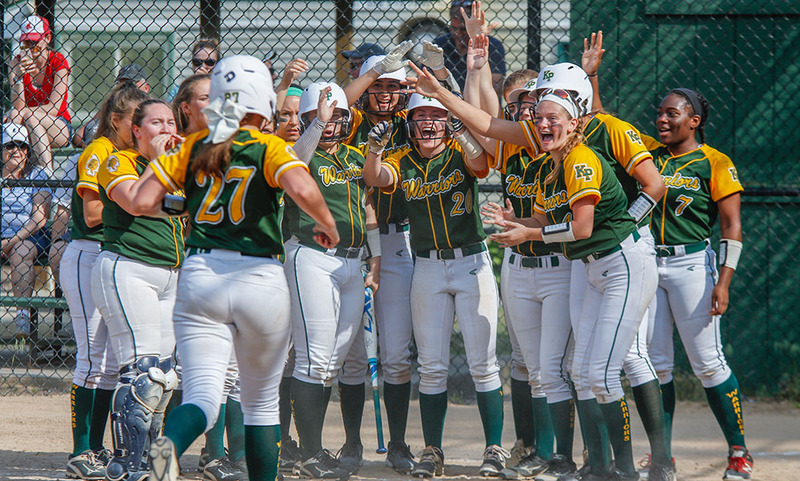 – King Philip scored its first run on its first hit of the game and plated the winning run off of the final hit of the game to beat Feehan. Sydney Phillips (two hits) put the Warriors up 1-0 with a leadoff home run in the bottom of the first. Feehan tied the game in the sixth inning. Brooke Taute drove in Faith Turinese (two hits) with a single in the eighth inning to KP a walk-off win. Elise Pereira pitched a complete game, allowing five hits (all singles) and one walk while striking out four. Canton, 12 @ Milton, 3 – Final – Seven different players found the back of the net for the Bulldogs led by senior Dylan Cunningham, who had a goal and two assists. Sam Walsh, Jack Albert, and Jace Emma made solid contributions in front of goalies Jack Connolly and Dylan Coyne. Canton, 8 vs. Milton, 18 – Final – Caroline Tourgee and Leah McClellan each scored a pair of goals and both assisted on a goal for the Bulldogs, who also got 13 saves from Vicki Revanche in the loss. Maggie Connolly had a goal and an assist for the second day in a row, Molly Colburn scored a pair of goals, Kaitlyn Goyetch had one goal, and Alexa Maffeo had a pair of assists for Canton. North Attleboro @ King Philip – Postponed to a date and time to be announced. Mansfield @ Westwood – Postponed to Tuesday, 5/29 at 4:00. Sharon @ Milford – Postponed to a date and time to be announced. Oliver Ames @ Mansfield – Postponed to Thursday, 5/24 at 3:45. Milford @ Sharon – Postponed to a date and time to be announced. Attleboro, 3 @ Taunton, 2 – Final – Taunton scored two runs in the bottom of the first inning but Attleboro chipped away with single runs in the third and fourth innings and then scored the winning run in the top of the fifth. Dakota Kirby had a leadoff single in the third and scored when Jon Candiales drew a bases-loaded walk. In the fourth, Troy Gamache led off with a single and scored to tie the game on an RBI double from James Weir. The Bombardiers took the lead in the fifth when Corey McKenna had a two-out single, stole second, and scored on an RBI single from Gamache. Ryan Morry earned the win, allowing two first-inning runs in a complete game effort. Morry allowed six hits — four in the first inning — before settling down, striking out three and walking one. North Attleboro, 13 @ Foxboro, 3 – Final – North Attleboro’s Nate Pearce launched a grand slam in the second inning, highlighting the Rocketeers’ sixth run frame in a win over Foxboro. North scored two runs in the first inning and tacked on five more in the third inning. Nick Sinacola improved to 7-0 on the season, allowing one run on two hits and one walk, striking out six in four innings of work. Matt Seavey earned the save, striking out five in three innings of work. Brendan McHugh went 3-for-3 and Zach DeMattio was 2-for-2 with five RBI. 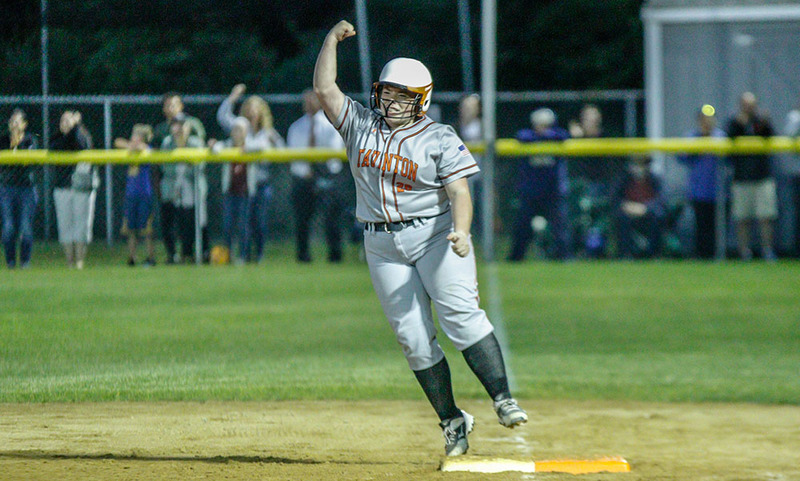 Stoughton, 9 @ Canton, 5 – Final – Stoughton got off to a great start, pushing across six runs in the first inning and never looked back. The Black Knights added three more in the second inning to build a large lead. Evan Gibb got the win on the mound, going 6.2 innings with three earned runs allowed on seven hits with two walks and three strikeouts. Gibb, Ruben Gonzalez, and George Currier each had two hits. James Genest added a two-run single, Robbie Seaman had a double with two walks, and Mike Nazzaro had two RBI and two stolen bases. Jack Brown got his first varsity hit and Tim Kellogg played stellar defense in the field for the Black Knights. King Philip, 2 @ Franklin, 5 – Final – Franklin senior Jake Noviello scattered five hits, struck out five, allowed two runs and didn’t issue a walk in a complete game effort to lead the Panthers to a win. Steve Luttazi (two doubles, RBI, run) and Jack Nally (RBI, run) each had two hits for the Panthers while Alex Haba (triple, run), Jake Macchi (RBI), and Colby Fitzgibbons (double) each had a hit. Pat Limerick (RBI, run), Jeremy Rhines (RBI), and Ian Zimmerman each had a hit for KP. Taunton, 21 @ Attleboro, 6 – Final (6 inn.) – Taunton held a one-run lead after five innings but exploded in the sixth for 15 runs to get the win. Kya Enos had four hits, including a double, with five RBI and four runs, Hanna Aldrich (double, home run, six RBI) and Mackenzie Handrahan (two runs) each had three hits, and Liana Duarte went 2-for-3 with an RBI and a run scored. Jaylin Couto got the win with four strikeouts and three runs allowed in 3.2 innings of work. Kelsey White came on in relief and struck out five with two runs allowed in 2.1 innings of work. Canton, 0 @ Stoughton, 7 – Final – Gina Carafa was 2-for-3 with a triple, two RBI and a run scored, Karly Estremera and Nikki Coppola each had two hits, and Taylor Levine contributed with a hit and two RBI. Carafa picked up her sixth win of the season, striking out five and allowing only four hits. Foxboro, 3 @ North Attleboro, 16 – Final – Bella Erti struck out sixth, recording her 100th of the season and went 3-for-4 with a double at the plate to pace the Rocketeers to a win over Foxboro. Olivia Capobianco was 3-for-3, including a leadoff home run and had four RBI, Annabelle Hebard added three hits and two runs, and Jaclyn Buckley had two hits and four RBI. Emily Nardelli and Stephanie Inglese both added two hits while Emily Pastore and Katherine Munley had one hit apiece and a run scored. 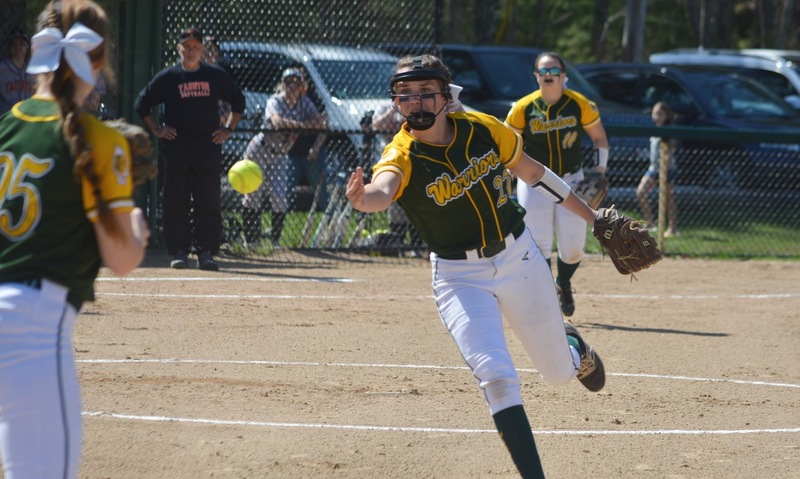 Franklin, 0 @ King Philip, 9 – Final – Brooke Taute set the tone early with a first-inning grand slam to help the Warriors sweep the season series against Franklin. Sydney Phillips, Jessica Bonner (two-run home run) and Brianna Lacy each had two hits. Elise Pereira pitched a complete game shutout, giving up only three hits while striking out five. Franklin, 17 vs. Dover-Sherborn, 7 – Final – Franklin’s offense had another strong game, picking up a win over D3 powerhouse Dover-Sherborn. Eric Civetti was responsible for 10 of those goals, scoring seven and assisting on three more. Jake Davis (three goals, one assist), and Matt Lazzaro (two goals, two assists) each had four points while Nitin Chaudhury and three assists. Jacob Alexander dominated the face-off X, winning 24 of 28 attempts. Connor O’Rourke made nine saves while Will Davis came in and made two stops. Oliver Ames, 17 @ Southeastern, 4 – Final – Oliver Ames recorded its 12th win of the season, setting a new program mark for regular season wins. The Tigers had 11 different goal scorers in the win with Owen Gallagher leading the way with three goals and three assists. Canton, 7 @ Holliston, 15 – Final – Leah McClellan scored three goals and assisted on three others for the Bulldogs in the loss. Maggie Connolly had a goal and an assist, while Caroline Tourgee, Molly Colburn and Rachel Beatty had one goal apiece. Vicki Revanche made 21 saves in defeat. King Philip, 15 vs. Bishop Feehan, 4 – Final – Caroline Klim continued her all-star season with six goals to lead KP to a big win over a potential playoff opponent. Alli Meehan added four goals and an assist and Olivia Tormey had two goals and an assist for the Warriors. KP also got goals from Shayla Weitzman, Jess Sullivan, and Mackenzie Mazur. North Attleboro, 4 vs. Natick, 18 – Final – Julia Tolfa scored two goals for North but the Rocketeers fell at home to Natick. Sharon, 13 @ Ursuline Academy, 12 – Final – For the second time this season, the Eagles rallied from four goals down at halftime to beat Ursuline. Sharon went on an 8-3 run in the second half and won the game on Sabrina Robbins’ fourth goal of the afternoon with just one second remaining. Emma Eberhardt scored five goals to lead the Eagles, adding the 100th of her career in the process. She also had two assists. Rose Wald made nine saves, including six in the second half. Maeve Barbera scored a pair of goals and Cass Barbera and Lydia Chase each had one. Canton, 3 @ Stoughton, 2 – Final – Stoughton won at first and second singles but the Bulldogs got the win at third singles and swept doubles play to beat the Black Knights. Freshman Minh Duong won 7-5, 6-2 at third singles, the team of Charlie Malloy and Aidas Jakubenas earned a 7-6, 6-3 win at first doubles and Ethan Nguyen and Justin Luk picked up a 6-1, 7-6 (4) win at second doubles. Stoughton freshman Waseem Sablon won 6-1, 6-2 at first singles and junior Erik Anderson earned a 6-2, 6-2 win at second singles. Foxboro, 0 @ North Attleboro, 5 – Final – North Attleboro’s three singles players combined to lose just a single game in a convincing sweep over Foxboro. Richard Bermudez won 6-1, 6-0 at first singles while Christian Bermudez and Jonah Manso each won 6-0, 6-0 at second and third singles, respectively. Ben Pfeffer and Vikram Senthilakumaran pulled out a 6-3, 6-2 win at first doubles and senior Alex Rinaldi and freshman Sam Gallagher notched their fourth straight win, 6-3, 6-2, at second doubles. Franklin, 0 @ King Philip, 5 – Final – King Philip clinched its second straight Kelley-Rex title with a sweep over Franklin. Marco DiStefano earned a 6-1, 6-4 win at first singles, Nick Putney prevailed 5-7, 6-0, 6-2 at second singles and Jack Cannon won 6-1, 6-4 at third singles. The team of Sean Desroches and Nate Ihley emerged with a 7-5, 3-6, 10-5 at first doubles and Nick Ihley and Aidan Ignatius teamed up for a 6-1, 6-0 victory at second doubles. Sharon, 5 @ Martha’s Vineyard, 0 – Final – Sharon swept the first of two matches with Martha’s Vineyard, winning all five matches with proset rules. Fred Bondar won 8-2 at first singles, Andre Olivei earned an 8-6 win at second singles and Danujan Thirumavalavan won 8-5 at third singles. The team of Max Brody and Ashwin Sreevatsa picked up an 8-5 win at first doubles and Arie Chinnappan and Alex Asprevailedaled 8-5 at second doubles. Sharon, 3 @ Martha’s Vineyard, 2 – Final – Sharon earned its second win on the day with a 3-2 proset win. Fred Bondar won 8-3 at first singles, Danujan Thirumavalavan earned an 8-7 (7-1) win at third singles, and Arie Chinnappan and Alex Aspel recorded an 8-2 win at second doubles. Attleboro, 0 @ Taunton, 5 – Final – Taunton earned its second win of the season over the Bombardiers, this time taking all five matches and doing so in straight sets. Junior Jillian Pagliuca won 6-2, 6-2 at first singles, senior Vanessa Rosa picked up a 6-0, 6-0 win at second singles, and freshman Jocelyn Pagliuca walked away with a 6-0, 6-0 decision at third singles. Juniors McKenzie Lucie and Samantha Martin won 6-0, 6-3 at first doubles and seniors Amanda Pugh and Gabrielle Fagundes earned a 6-0, 6-0 win at second doubles for the Tigers. Stoughton, 0 @ Canton, 5 – Final – Canton freshmen Natalie Keppler and Rachel Kupferman had strong performances on the day with neither losing a game in their respective matches. Keppler (first singles) and Kupferman (second) each won 6-0, 6-0 while sophomore Sarah Hernandez picked up a 6-0, 6-4 win at third singles. Senior Caitlin Matthews and sophomore Stelina Michaelidis won 6-1, 7-6 (6) at first singles and the team of seniors Jenna Moyle and Anjali Mandal earned a 6-1, 6-4 win at second doubles for the Bulldogs. Mansfield, 2 @ Oliver Ames, 3 – Final – Oliver Ames swept doubles play and earned a win at third singles to edge Mansfield. Kristin Bloumbas and Emily You prevailed 7-6 (5), 6-0 at first doubles, Olivia Groebe and Rachel Stryke picked up a 6-3, 6-2 win at second doubles, and sophomore Maura Kiernan dropped just one game in a 6-1, 6-0 win at third singles. Mansfield’s Sarah Doyle recorded a 6-1, 6-2 win at first singles while Elizabeth Elsner emerged victoriously, 6-4, 7-5, at second singles. Foxboro, 0 @ Taunton, 3 – Final – Taunton junior Jack Moynihan struck out nine batters without allowing a walk or a run in 6.2 innings of work to help the Tigers beat visiting Foxboro. The Tigers pushed across two runs in the bottom of the first inning and tacked on one more in the fourth inning. Evan Melo had two hits for the Tigers while Sean Quinlan and Jacob Crawford each had an RBI. Foxboro’s Michael Devlin went 2-for-3 on the day. Stoughton, 11 @ King Philip, 5 – Final – Stoughton overcame an early five-run deficit, tying the game and taking the lead in the fifth inning, and added five insurance runs in the top of the seventh to get the win on the road. Stoughton scored two runs in each the third and fourth innings to get within a run. Senior Ruben Gonzalez led off with a triple in the fifth and scored on a squeeze from George Currier. Stoughton took the lead when Matt Hadley doubled and scored on a two-out single from Robbie Seaman. Zak Paquette got the win for the Black Knights with three earned runs allowed, no walks, and two strikeouts. North Attleboro @ Attleboro – Postponed to Tuesday, 5/1 at 3:45. Canton @ Franklin – Postponed to Tuesday, 5/1 at 3:45. Sharon @ Mansfield – Postponed to Tuesday, 5/1 at 3:45. Milford @ Oliver Ames – Postponed to Tuesday, 5/1 at 3:45. Franklin, 12 @ Canton, 6 – Final – Franklin pushed across five runs in the first inning, highlighted by Jackie Cherry’s three-run home run, and never trailed in a win on the road at Canton. The Panthers added four more runs in the second and then added three insurance runs in the top of the seventh. Tara Hartnett had two hits, including a triple, and an RBI, Peyton Arone went 3-for-3 with an RBI, and Natalie Stott had a two-run single. Cherry and Emily Valentino combined for 10 strikeouts for Franklin. Taunton, 16 @ Foxboro, 1 – Final (5 inn.) – Taunton senior Kya Enos went 3-for-3 and drove in two runs and sophomore Payton Ceglarski had three hits, including two doubles, and three RBI as the Tigers notched a big win on the road. McKenzie McAloon went 2-for-2 with two RBI, Mackenzie Handrahan had two hits, including a double, and knocked in a pair of runs, and Jaime Brown and Kelsey White each had two hits and an RBI. Alexa White earned the win in the circle, allowing three hits while striking out eight. King Philip, 14 @ Stoughton, 3 – Final – Meghan Gorman recorded four RBI and scored three runs and Sydney Phillips added three hits and two runs scored to pace the Warriors to a big win. Hailey McCasland, Nicole Carter, Faith Turinese, and Brooke Taute all had multiple hits on the day with KP totaling 17 as a team. Elise Pereira pitched a complete game, allowing three runs in the first but then blanked the Black Knights over the next six. Stoughton’s Gina Carafa was 3-for-3 with a double and two singles, Jordan Lyons was 2-for-4 with a double, and Karly Estremera added another hit. SHS coach Deb Parker noted catcher Brianna Ferrandiz had an outstanding game defensively. Attleboro @ North Attleboro – Postponed to Tuesday, 5/1 at 3:45. Mansfield @ Sharon – Postponed to Wednesday, 5/30 at 3:45. Oliver Ames @ Milford – Postponed to Tuesday, 5/1 at 4:00 at Oliver Ames. Attleboro, 3 @ North Attleboro, 12 – Final – North Attleboro got it done on both ends of the field in a non-league win over Attleboro. Tommy Lindstrom had four goals and five assists, Andy DeMattio scored four goals, and Jack Connolly dished out three assists. Jason McNeany added two goals while Nick Ward and Nick Morse each scored once. North’s defense of Will Yeomans, Max Fontes, Brett Labonte, and Tom Lockavitch combined to force a dozen turnovers while Jack Puccio made five saves in net. Milford, 8 @ Oliver Ames, 17 – Final – Oliver Ames used a 10-0 run between the second and third quarters to record a win over visiting Milford. Owen Gallagher (one goal, five assists) notched his 100th career point in the win while Sam Stevens and Eric LeBlanc finished with four goals apiece. Frankie Ireland finished with seven points (two goals, five assists) for the Tigers. North Attleboro, 17 @ Attleboro, 3 – Final – After a week off, North Attleboro got back on track with a big win on the road. Mackenzie Rosenberg paced the Rocketeers with three goals and four assists, while Katie Lindstrom added four goals and an assist. Camille Pizarro had a hat trick for North, which also got goals from Lilly Cameron, Julia Tolfa, Lexi Sinacola, and Regan Fein. Faith Graveline and Kayla Moulin each made three saves in the North goal. Rocketeers coach Colleen Carchedi said of Attleboro that the Bombardiers played an “aggressive” game and had a strong second half. Mansfield, 21 @ Canton, 13 – Final – Click here for a Photo Gallery from this game. Foxboro, 21 @ Bishop Feehan, 9 – Final – Sophia DiCenso and Caroline Boudreau each scored five goals as the Warriors offense exploded for 21 goals in an impressive non-league win. Foxboro also dominated the draw controls with Boudreau, DiCenso, and Christina Rogers controlling the center circle and helping the Warriors win 23-of-29 in the game. Franklin @ Canton – Postponed to Tuesday, 5/1 at 3:45. Taunton @ Foxboro – Postponed to Tuesday, 5/1 at 3:45. King Philip @ Stoughton – Postponed to Thursday, 5/3 at 3:45. Mansfield @ Sharon – Postponed to Tuesday, 5/1 at 3:45. Oliver Ames @ Milford – Postponed to a date and time to be announced. Foxboro @ Taunton – Postponed to Thursday, 5/24 at 3:45. Stoughton @ King Philip – Postponed to Thursday, 5/3 at 3:45. PLAINVILLE, Mass. – Heading into the bottom of the seventh inning of Saturday afternoon’s first meeting between the preseason Kelley-Rex title favorites at the Plainville Athletic League fields, King Philip had been held without a hit by Taunton freshman pitcher Kelsey White. The Warriors had the middle of the order due up for the final at-bat and plenty of confidence on the bench that a comeback was still possible. A lead-off single by Meg Gorman broke up the no-hitter, catcher Brianna Lacy battled for a two-out walk to keep the game alive and senior pitcher Elise Pereira, who had not gotten the ball out of the infield in her first two at bats, drilled a two-out, walk-off three-run homer over the left-field fence. Pereira’s blast gave KP a 3-2 victory, stunned the Tigers, and gave the Warriors an early edge in the race for the league title, which KP has won 11 times in the past 12 years. Coming into the game, both teams had been relying on potent offenses, but Saturday was a pitcher’s duel, as White and Pereira were both keeping hitters off-balance by hitting spots and mixing speeds. MacKenzie Handrahan lined a single to left to start the second and, after a strikeout, she barely beat Gorman to the bag after the KP shortstop made a superb diving stop behind second. With two on and no outs, Pereira got a strikeout and a fly ball to left to get out of the jam. Taunton broke the deadlock in the fourth inning. Kya Enos got it started by drawing a walk and advancing to second on a comebacker from Handrahan. A wild pitch moved the Taunton senior catcher to third and with a 3-0 count, freshman Hanna Aldrich dropped down a perfect suicide squeeze bunt to get the run home. It was a game with few mistakes, as both defenses were just about flawless through the first few innings. In the sixth, Taunton added an insurance run and again it was the middle of the order that came through. With one out, Enos lined a single to left and Handrahan followed by driving a bouncing ball through the left side. Enos stole third on a ball in the dirt and Aldrich had a swinging bunt up the first base line, which she turned into a hit by avoiding the tag of Brooke Taute, and earned her second RBI of the game. KP had little going offensively. 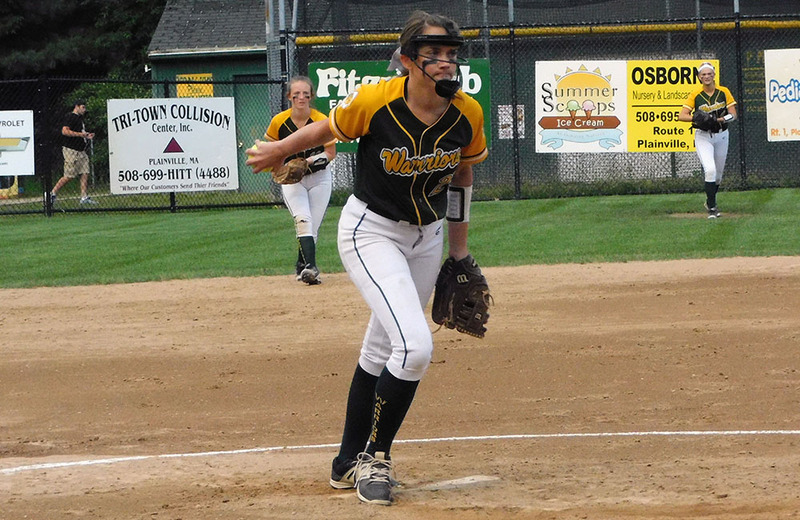 After getting a runner to second in the first and another baserunner in the second, the Warriors did not get another player on base until two outs in the sixth when Sydney Phillips reached on an error. White fielded a pop up in front of the plate to close out the inning and preserve the two-run lead. The Tigers could have put the game away in the seventh. Alexa White ripped a single down the left-field line and Kelsey White drew a four-pitch walk. Jaime Brown dropped down a sacrifice bunt to move both into scoring position and an error on a popped up bunt by Liana Duarte loaded the bases with one out. Enos hit one to Taute at first, who was able to get the lead runner at the plate, and Handrahan bounced back to Pereira to end the threat. Pereira scattered six hits in the game, while striking out seven (many on her change-up) in what both she and her coach called her best start of the season. Gorman started the rally in the bottom of the seventh with a single to left, her second time reaching base in the game. After a pop up to Aldrich at short and a liner right to Handrahan in left, Taunton was one out from the win. Lacy put a scare into the Tigers ripping a long foul ball to left that would have been gone had it been pulled a little less. She fouled off several White pitches and fought her way to a hard-earned walk that brought the winning run to the plate. Pereira fell behind but she squared up the pitch she was looking for and crushed it over the left-field fence to the right of the scoreboard and lifted KP to an improbable win when it seemed like the Warriors were going to fall behind their biggest rivals in the division. King Philip (5-2, 4-0) will be on the road to face Stoughton on Monday, while Taunton (5-2, 4-2) will try to bounce back on Monday at Foxboro. Mansfield, 9 @ Attleboro 2 – Final – Mansfield struck for five runs in the top of the third inning and never looked back on the road at Attleboro. Senior Tyler Dalton earned the win on the mound, striking out six in five innings of work with three hits and two runs allowed. Jake Gerraughty and Justin Pena each pitched a scoreless inning in relief. Kyle Moran (RBI), Dan Saraceno, and Kevin Dow (three RBI) each had two hits apiece to pace the Mansfield offense. Foxboro, 1 @ Stoughton, 2 – Final – Stoughton edged Foxboro in a pitchers duel between Zak Paquette (S) and Steve McLaughlin (F). Paquette allowed just one run on five hits and one walk with five strikeouts in a complete game effort. McLaughlin allowed two runs in over five innings of work for the Warriors. George Currier (2-for-3) came up with the big hit for Stoughton, connecting on a two-strike, two-out, two-RBI single in the first inning. Franklin, 1 @ Walpole, 0 – Final – Franklin senior Jake Noviello dazzled in a complete game effort, helping the Panthers pick up a 1-0 win. Noviello blanked the Rebels through seven innings, allowing just four hits and two walks while striking out six. Franklin’s lone run came off the bat of James Leofanti, scoring classmate Steve Luttazi (2-for-3) on a sacrifice fly. Jake Macchi and Jack Nally also had two hits for the Panthers. North Attleboro, 8 @ Bishop Feehan, 1 – Final – North Attleboro turned a pitchers’ duel into an impressive with behind a big fifth inning. The Rocketeers pushed eight runs across in the fifth inning, all with two outs. Big Red loaded the bases (Nick Sinacola single, Zach DeMattio walk, Nate Pearce walk) to get things started. Nolan Buckley had a two-run single, Aidan Harding (4-for-4) knocked in a run with an infield single, Sinacola (4-for-5) got back up and plated two with a single and Jeff Gale capped the scoring with a two-run single. Sinacola got the win on the mound, throwing a complete game with 10 strikeouts and just two walks. He had a no-hitter through four innings of play. Taunton, 6 vs. Durfee, 5 – Final – Taunton scored four runs in the bottom of the fifth inning to knot the score at five and scored the game-winning run an inning later to stay unbeaten so far this season. Christian Simoes (two RBI), Tyler Medeiros (two hits), and Jack Moynihan (two hits) all had RBIs in the fifth inning to tie the game. Trevor Pietrzyk (two hits) drove in the winning run with a sacrifice fly in the sixth. Medeiros earned the win on the mound, striking out five with six hits allowed in six innings. Josh Lajoie pitched a scoreless seventh inning to record the save. Foxboro, 2 @ Stoughton, 15 – Final (5 inn.) – Foxboro opened the game with two runs in the top of the first inning but Stoughton answered with four runs in the bottom half to take the lead and never look back. The Black Knights added single runs in each the second, third, and fourth innings and then exploded for eight runs in the fifth to get the win. Gina Carafa (three doubles) and Nikki Cappola (two doubles) each finished with four hits and three RBI to pace the Stoughton offense. Lexi Baptista and Bri Ferrandiz each had two RBI as well. Hannah Davis had two hits for Foxboro, including the 100th of her career. Carafa got the win in the circle, striking out eight with three hits and two walks allowed in five innings of work. Franklin, 1 @ Taunton, 14 – Final (5 inn.) – The Tigers scored in four of the five innings of play in a big win over visiting Franklin. Jaime Brown (three runs), Liana Duarte (three RBI), Mackenzie Handrahan (two RBI) and Kelsey White (two runs) each recorded two hits for Taunton while Payton Ceglarski chipped in with a pinch-hit two-run home run and Rylie Murphy had a pinch-hit two-run single. Jaylin Couto struck out three with four hits allowed in four innings of work. Alexis White recorded three strikeouts in one inning of relief. Ally Shea went 2-for-3 for the Panthers. Kylie Bouzan knocked in courtesy runner Maggie Hobby in the fourth inning for Franklin’s run. King Philip, 16 @ Bishop Feehan, 6 – Final – King Philip’s offense roared to life, belting out 16 hits in a big win on the road at Bishop Feehan. Hailey McCasland and Jessica Bonner (three RBI) each had three hits for the Warriors while Marjorie Guerrier, Meghan Gorman (three RBI), Brooke Taute, and Sydney Phillips each had two hits. Bonner put the Warriors ahead, 8-6, with a hit in the top of the sixth inning. Faith Turnese allows just one hit in three innings of relief work to earn the win. Milford, 11 vs. Hopkinton, 2 – Final – Milford’s offense continued to roll, putting up 11 runs against neighboring Hopkinton. Jess Tomaso had a big day at the plate with three hits, including a home run and a double, whiling knocking in four runs and scoring once. Kelley Reichert went 3-for-3 at the plate with two RBI and earned the win in the circle, striking out six without allowing an earned run in five innings of work. Kate Irwin (double, stolen base), Emily Piergustavo (RBI, run), Emily Hartman (double), and Shannon Cormier (double, two runs) each had two hits for the Hawks. Oliver Ames, 3 @ Coyle & Cassidy, 7 – Final – Oliver Ames’ Kayla Georgeu was 2-3 with a single and an RBI double while Abbi Holmes and Colleen Larson both had RBIs as well. Lexie Campbell (1-4), Caroline Mahoney (1-3) and Katie Mills (1-2) all scored runs for OA. Mansfield 13, @ Needham, 0 – Final (5 inn.) – Sarah Cahill struck out seven and allowed only one hit as the Hornets starter and Felicity McMullin struck out one in relief. Mansfield started well with a run in the first before breaking the game open by scoring five runs in each of the second and third innings and adding a pair in the fourth. Caty DeMassi went 3-for-4 with a pair of RBI and Kerran Holmes went 2-for-2 with an RBI. The Hornets also got hits from Kara Bendanillo, Megan Letendre, Mady Bendanillo, Grace Benton, and Mary Muldoon. Stoughton, 1 @ Canton, 16 – Final – Canton jumped out to a quick start, building an 11-1 lead by halftime. The Bulldogs had nine different scorers including first-career goals from senior Brian Ghostlaw and sophomore Tommy Ghostlaw. Freshman Dylan Coyne had a shutout in net in the fourth quarter for Canton. Milford, 16 @ Northbridge, 5 – Final – Milford freshman Jack LeBlanc was impressive at the face off X in his first varsity game, winning 8-of-13 attempts to help the Hawks pick up the win. Brendan White (five goals) and Andrew Gallagher (two goals, four assists) paced the offense while Ryan Hazard had a strong all-around game with four goals and five ground balls. Oliver Ames, 20 @ Milton, 0 – Final – Oliver Ames received strong defensive efforts from Shane Murphy, Matt Saba, and Mark Vasapollo to help goalie Nick Gillis record a shutout on the road against Milton. Owen Gallagher paced the offense with six goals while Eric LeBlanc added three tallies. Canton, 11 @ Oliver Ames, 19 – Final – Emalyn Duvall, Chloe Kilkelly, Ella Hogan, Olivia Piazza and Sofia Masciarelli all tallied points for OA while Ariana Waldorf had a strong game in net. Maggie Connolly scored four goals for the Bulldogs and Vicki Revenge stepped in as the back-up goalie to make 11 saves in the loss. Sharon, 8 @ Hopkinton, 13 – Final – Sabrina Robbins scored four goals and grabbed five ground balls for Sharon and Emma Eberhardt added a hat trick of goals, four assists, and six draw controls. Jenna Goldstein scored Sharon’s other goal and Bridget McManus led the Eagles defense with an interception and three ground balls. Mansfield, 3 vs. Norton, 2 – Final – Mansfield notched two wins in singles play and one in doubles to pick up a non-league win over Norton. The team of juniors Tessa Garufi and Hannah Podolske had the game of the match, earning a 7-6 (8-6), 7-6 (8-6) win at first doubles for the Hornets. Senior Sarah Doyle won 6-3, 6-3 at first singles while junior Elizabeth Elsner recorded a 6-4, 6-3 decision at second singles.